Lisa loves John: Life Lately! This past weekend John and I celebrated our 5th wedding anniversary! It feels like it has been so much longer and shorter, all at the same time... isn't it funny how that happens?! We had a perfect weekend of relaxing pool side with beautiful weather and eating our fair share of delicious food... spot on fabulous, if you ask me! It's been a while since I've shared all that we've been up to, so I thought I would do a quick catch-up post. Here's a peek at some of our recent adventures. On the way home from our trip to Alaska, we decided to tack on a day trip to Seattle. We spent last Thanksgiving there, but this was my first time visiting in the summer... the weather was lovely and the mountain was clearly visible with the clear blue skies! An obligatory stop to Pike Place Market... I swear, if I lived in Seattle, I would frequent this place daily for all of the fresh produce and flowers! Summer fruit has been my delicious go-to my whole pregnancy, and my mouth was certainly watering with all of the delicious fresh fruits and vegetables! ...And these peonies - be still my heart! Bucket, after bucket, after bucket of freshly cut flowers! Immediately after Seattle (and Alaska before then), I had to head straight to Arizona for a week of work. Let me tell you - I was happy to be there, but was definitely struggling to find clean clothes to wear, and my body was quite in shock going from the beautiful cool summer to the 115 degree Arizona heat! With all of the recent airport travel time, I figured there was no better time to start a new Bible study. 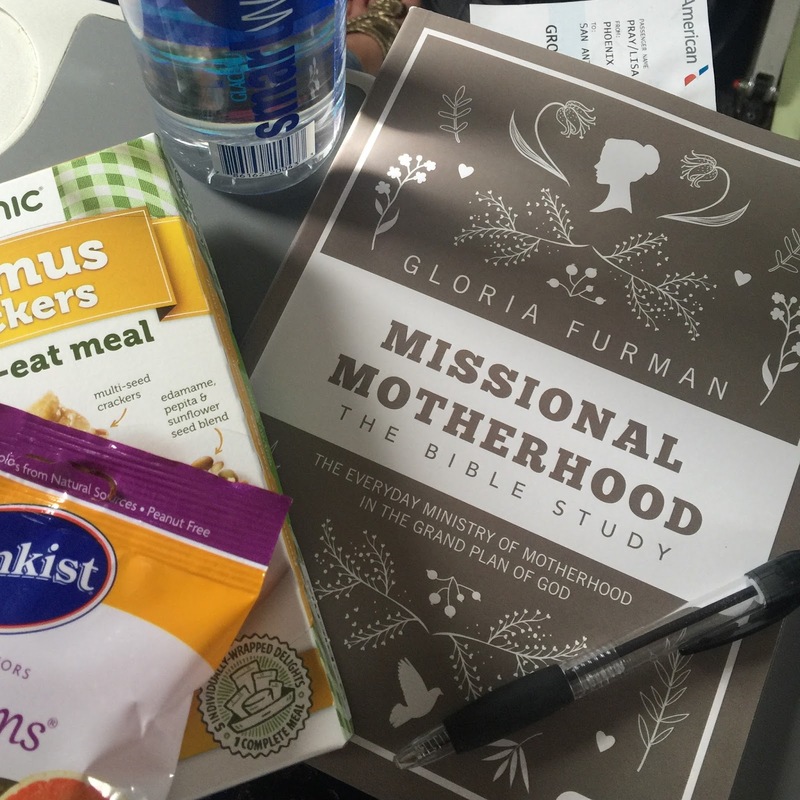 I picked up Gloria Furman's new study, Missional Motherhood, and so far, I have quite enjoyed it! It is much, much less intensive than a Beth Moore study, which is good for me given how busy I am. I was so excited to be back home in Texas with John and to finally spend some time with these two hooligans. They are just too much and so silly together - I absolutely love it. John and I recently took Scout and Lily to the absolute best dog park in Austin - Red Bud Isle. The park is an island and the pups can swim, run, and explore the whole area off leash... it was so great! A delicious lunch at The General Public (paired with a little shopping!). I couldn't be more happy to be married to this man, and I am looking forward to a long lifetime together! So glad you guys had a nice anniversary- you're so right that times sometimes feels like it just happened but feels like forever ago at the same time. Seattle seems like such a cool place to visit! Your adventures are so amazing! I want to go to Seattle as well. Happy Monday! Happy anni you two!! I have a feeling this year will be the best one yet! That Seattle picture is awesome! I don't know how you do all that traveling!! I want to go to Seattle so badly one day! It looks beautiful! Cannot believe you could see that gorgeous mountain, too! Yay! Wow, that market looks incredible! So jealous of the people who live nearby! Happy anniversary, kids!! It's crazy how fast and slow it all goes, isnt it?? Happy Anniversary!! Looks like y'all are having a blast! Girl, I don't know how you aren't exhausted from all our travel! aw happy 5 years!! we just had our 8... isn't it crazy how fast time flies?! your travels looks soooo amazing! i love that cactus shot soooo much! Loving all the photos ! The park for the dogs is such a nice idea. They must have had so much fun in the water. That's an awesome dog park where they can swim as well! I loved the pike market when I went to Seattle as well! That fresh fruit and flowers - heavenly! How fun! I LOVE Seattle! Sounds like you got great weather, too! I think I went to General Public for brunch once...I think...I can't remember :-P Happy belated anniversary Lisa and John!